The discussion about the need for a decolonisation of knowledge production and critical reflection on “epistemic violence” as described by G. Ch. Spivak has become a central aspect of the postcolonial discourse in recent years. 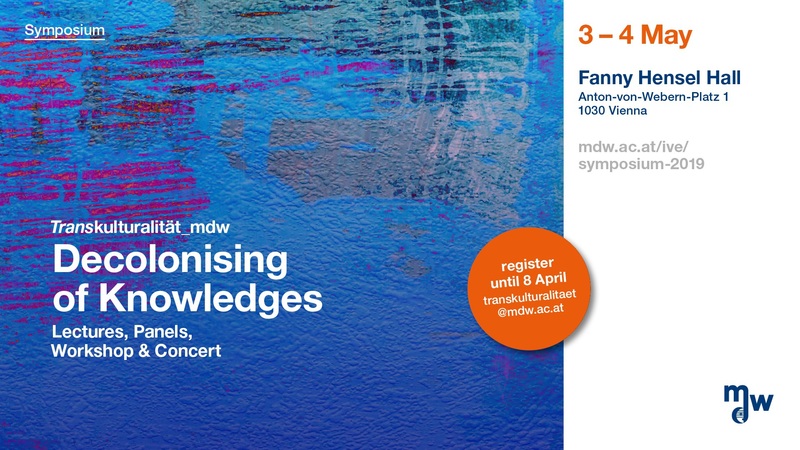 Assuming that this need is also an urgent and ongoing task in academia, the symposium wishes to elaborate the conditions for a “Decolonising of Knowledges” particularly at art universities and in the artistic and cultural field. Investigating the relations between knowledge and power, it looks into the proposal of a “Meeting of Knowledges” and suggests “Decolonising ‘World Music’” as a way of critically re-framing the musics of the world in the context of current practices, struggles and conditions of production and consumption. Preparatory team: Julia Fent (Coordination), Ursula Hemetek, Harald Huber, Therese Kaufmann, Gerda Müller, Hande Sağlam. Weiter Dein Weg zum Kulturjob – Informationsveranstaltung am 10.04.2019, 4:00-5:30 p.m.